This brand new title in the popular at a Glance seriescombines the science behind ECGs with how to use them to guide diagnosis and treatment. These key skills are fundamental for examination of the cardiovascular system and all medical students and specialist nurses are expected to be proficient at ECG interpretation. 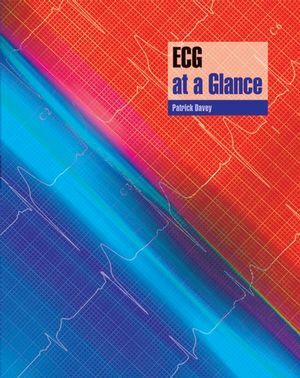 The at a Glance approach provides a large number of clear diagrams and example ECGs alongside concise text, putting the ECGs into a clinical context, all in easy-to-absorb double-page sections. Patrick Davey is Consultant Cardiologist at Northampton General Hospital & Honorary Senior Lecturer at the John Radcliffe Infirmary, Oxford. He was previously a Clinical Tutor at Oxford University. 1 Introduction to the ECG. 2 Strengths and Weaknesses of the ECG. Part 1 The Normal ECG. 3 Basis of the ECG. 4 The Normal P Wave. 5 The Normal QRS Complex. 6 The T and U Waves. 7 Abnormalities in the Shape of the P Wave – Left and Right Atrial Enlargement. 9 Q Waves and Loss of R Wave Height. 11 Long PR Interval and QRS Broadening. 15 Mild T Wave Flattening. 16 Deep T Wave Inversion. 17 QT Interval and U Wave Abnormalities. 27 Emotion and the ECG. 30 Non-ST Segment Elevation Myocardial Infarction. 31 ST Segment Elevation Myocardial Infarction. 32 Aortic Valve Disease and Hypertrophic Cardiomyopathy. 37 Endocrine Disease and Electrolyte Disruption. 38 Psychological Disease and its Treatment. 40 Distinguishing Supraventricular From Ventricular Tachycardia. 45 Atrioventricular Nodal Re-entrant Tachycardia. Part 5 Bradyarrhythmias and Related Diseases. 53 Left Bundle Branch Block. 54 Right Bundle Branch Block. 55 First Degree Atrioventricular Block – Long PR Interval. 56 Second Degree Atrioventricular Block. 57 Atrioventricular Block – Third Degree Heart Block. 58 Pacemakers – Basic Principles. 60 Anti-tachycardic and Heart Failure Devices. 61 External and Internal Loop Recorders. 62 Tilt-table Test and Carotid Sinus Massage. 64 The Exercise Stress Test.